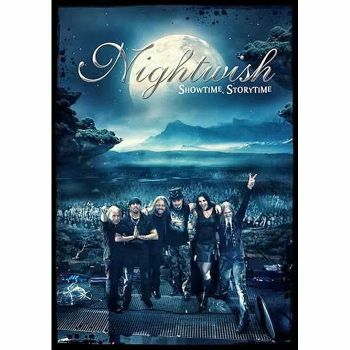 NIGHTWISH - SHOWTIME, STORYTIME (2DVD) | Online Shop | Wizard LTD.
»Showtime, Storytime« contains the entire NIGHTWISH headliner show, played at this years&apos; legendary Wacken Open Air - the world&apos;s biggest heavy metal festival. The live show in the front of 85 000 screaming metalheads was directed by Ville Lipiдinen, filmed with seventeen cameras and has a total duration of 85 minutes. The second disc consists of 120-minute tour documentary &apos;Please Learn The Setlist in 48 Hours&apos;, also directed by Ville Lipiдinen, with no short of drama or overall madness. Also, there is a 16-minute NIGHTWISH Table Hockey Tournament, filmed on tour. On top of this there are two music clips: &apos;I Want My Tears Back&apos; (Live at Hartwall Arena) and &apos;Ghost Love Score&apos; (Live in Buenos Aires). The Wacken Open Air appearance was the first of the three final shows of the band&apos;s Imaginaerum World Tour 2013, which saw the Norsemen and their Dutch amazon Floor Jansen (REVAMP) playing of 104 concerts in 34 different countries with total audience of over 1,5 million fans around the globe. Mastermind and keyboardist Tuomas Holopainen states: "Our darling flying Dutchwoman, Floor Jansen, has been nothing but incredible during her time in NIGHTWISH on this tour, so this is a perfect opportunity to immortalize the current vibe of the band on film!"